Diagram A. Gun passes to coach. 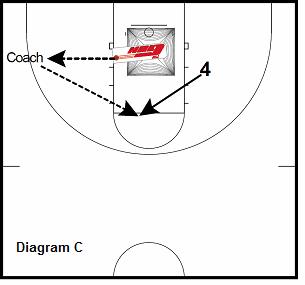 Coach passes to 1 who uses over head pass to reverse the ball. 2 catches and shoots the 3. Coach alternates the wing he passes to and the drills is continuous. Diagram B. 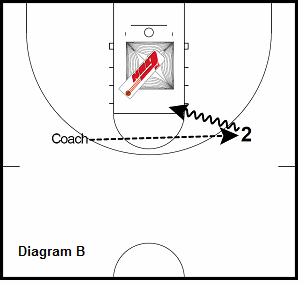 Gun passes to Coach who then reverves the ball to 2. 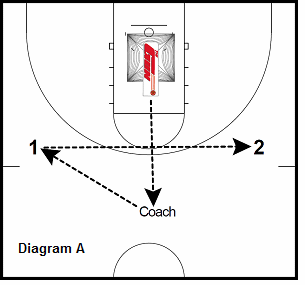 Drill: 2 makes (10) floaters, (10) one dribble jumpshots, (10) catch and shoot 3's. Do on both sides of the court. Diagram C. 4 flashes to high post for a catch and shoot. Player returns to starting point to repeat.